Despite coverage of many items, Senator Al Gore is not knowledgeable about the environment, and his book is neither balanced nor without factual error. I found it interesting that in their debate Al Gore did not attempt to refute the often-repeated claim by Dan Quayle that Bill Clinton does not tell the truth, that he lacks the character to give a full version of his story. I find much of the same situation in Gore’s book. I also find that Al Gore is so interested in promoting panic, he ignores respected authorities who differ from the opinions of his “experts” which are reported with a smattering of unsupported and unsupportable figures. In a chapter “Acknowledgements,” Mr. Gore thanks individuals and books for providing him the information presented in the book. This is a way to shift blame for any error and actually admits his lack of research. That could explain why there is no mentions of expert authority that differs from his opinionated science. It is the way of life with many media people more interested in attention than in factual analysis of subjects, more interested in compensation, than they are in effective solution of problems. Gore’s seven years as a journalist before assuming the Senate job of affecting human destiny obviously made a lasting impression. 1. Gore blames environmental degradation on the separation of science and religion. He calls it the “separation of facts from values, knowledge from morality. (P 256) The result: “the atrocities of Hitler and Stalin and the mechanical sins of all who helped them.” Then he extends it to the crimes against the earth and the mechanical sins of equipment that permit the extractive industries to satisfy human needs. Environmental morality, apparently from the illustrations he uses, requires equal protection of humans, animals and plants. There is no recognition that science and religion operate in entirely different ways and that there is no need to confuse the two. He really promotes pantheism. The quoted speech should correctly be attributed to a screen writer, Ted Perry, who later taught film and theater at Middlebury College. Perry, it appears, according to a news report aired on National Public Radio on June 8, 1991, wanted a quote for an environmental script he was writing for Southern Baptist Radio and Television Commission sponsored program “Home.” Since he could find none that suited 1970’s environmentalism, he concocted one. Sierra Club, World Wildlife Fund, World Council of Churches, and Pax Christi among many use this “speech” in their environmental frenzy. Using a graph, Gore announced (P 24) that “living species of plants and animals are now vanishing around the world one thousand times faster than at any time in the past 65 million years. (Italics by Gore.) The science source for this information is not mentioned. Gore recalled the three-day ordeal of the little girl, Jessica McClure, who fell into the well in Texas and the attention of millions while she was being rescued. He then agonized (P28, 273) over the 100,000 boys and girls who died of preventable causes during the same period–and attributed their deaths to failure of both crops and politics. No mention is made of the millions of children and adults who die from malaria because the USA environmentalist leader Ruckelshaus banned DDT. Ruckelshaus admitted this was a political, not a scientific, decision. Gore would now promote more of such political decision making. Moral aspects of condemning children to death by malaria because of the banning of DDT are ignored. Harming planet Earth is the expressed concern. Gore’s complaint: “their views sometimes carry too much weight.” He prefers air chemists who, as described by one scientist, are comparable to individuals playing a game of dice that has no rules. Research grants are more important than scientific pride and integrity. Ironically, although he lamented that Galileo was a minority of one whose fault lay in differing with the politicians at the time. (P 40) Gore does not give Lindzen the same recognition. Viewpoint can make a difference. Gore starts his chapter. “The Shadow Our Future Throws” with “The most dangerous threat to our global environment may not be the strategic threats themselves but rather our perception of them, for most people do not yet accept the facts that this crisis is extremely grave.” “…it is all too easy to exaggerate the uncertainty and over study the problem… in order to avoid an uncomfortable conclusion.” Gore thus brushes off those with data that show an opposite conclusion and feels free to promote his perception. Global warming and the ozone layer depletion get special attention in the book. 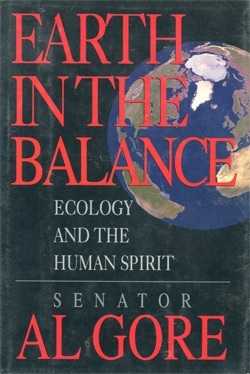 The author uses them to illustrate how human activity has upset the atmospheric equilibrium within the larger global ecological system over the atmospheric equilibrium within the larger global ecological system over the past few decades–an equilibrium, he says, that had reached dynamic equilibrium over the eons. If you check history you will find that the equilibrium he refers to has had many cataclysmic upsets by nature. He writes convincingly, if you are not interested in data that could be used to prove or refute his assertions. He writes convincingly, if you are already frightened because his assertions are blanket scares. Whether either level is good or harmful is not discussed. He apparently attributes this rise to the use of CFCs (chlorofluorocarbons) because there is no mention of the other sources of chlorine to the atmosphere. CFC contributes about 0.75 million tons a year; evaporation of sea water accounts for over 300 million tons. He also neglected to mention a discharge of 1000 tons a day of chlorine from Mt. Erebus, a volcano some 10 miles upwind from the measuring station in Antarctica. Again, had he wanted to report he whole story he could have noted that stations in operation since 1974 to measure ultraviolet light reaching the earth’s surface have shown a continuously decreasing penetration of from 0.5 to 1.1% per year. If there were really a crisis, the radiation would have been increasing. It is also interesting that if CFC’s were guilty as charged, they could be reporting the presence of fluorine. The criminal aspect is that, with patents expiring, CFC could be manufactured in the developing countries cheaply. It offers a nontoxic means for third world nations to have refrigeration. Thanks to the Montreal Protocol and influence of US Agency for International Development, World Bank requirements and UN pressures, these poor nations will be deprived of an essential ingredient for improving health. DuPont and three European companies will reap a fortune in providing expensive substitutes. We will pay a penalty when the refrigerator at home and air conditioning at home and in cars can not use the substitutes. The new products are reported to cost $20 per pound; Freon was less than $1. Many times Gore offers his concern that a new approach must be offered the people in underdeveloped countries is they are to improve. Longevity in developed nations increased with chlorination of water, refrigeration and immunization. EPA is protesting the use of chlorination because it might cause cancer. Now with the banning of Freon, the opportunity for refrigeration of food and medicine is eliminated. Lip service, while depriving the people of assistance is sheer hypocrisy. There is adequate scientific data to question both the cause of periodic ozone fluctuation and its assumed importance. If Gore’s concern over people’s suffering is real, he could take time for a new look. “The Holes in the Ozone Scare” by Maduro and Schauerhammer would be an excellent start. They weren’t looking for a research grant. A similar condemnation lies in Gore’s use of junk science in his foretelling doom from rising temperatures resulting from global warming. Gores objective is simple: a carbon tax (P 349) forcing abandonment of our present industrial and transportation systems. Clinton said he would only tax the wealthy but if the world summit agrees to a carbon tax, Clinton can say he must comply and Gore will call it essential to save the planet. Gore condemns laissez-faire economics. He promotes a centrally controlled economy, which he calls “a modified free market economy” (P 298) in which the state tells business exactly what it can or can not do. Bureaucracy reigns despite Gore’s critical assessment of inefficient bureaucracy. (P 301) Yet, Gore insists the only way to save the planet is to develop a Global Marshall Plan under which the heads of state of undeveloped and developed nations would, at annual environmental summit meetings, agree on policies to (1) stabilize world populations, (2) create environmentally appropriate technologies, (3) change economic rules to measure impact of decisions on the environment, (4) approve international regulatory agreements, and (5) educate children to understand threats to the environment. If the Gore approach to understanding the environment is to be perpetuated in the process, fear will reign. Gore calls for all developed nations to contribute to the cost but admits most money would come from the United States because countries like Japan and Germany are not contributing as they should. Apparently, the crisis can’t wait for them to change. The original Marshall Plan took 2% of our Gross National Product. Today, Gore says that would mean about $100 billion a year for the USA (P 304) compared to the $15 billion we now commit to our total non-military aid. Gore claims bipartisan support and critical need. Further reading develops the approach he proposes. The funds would not go to those in power in the undeveloped nations because they could send it out of the country. Part of the debt of these nations would be swapped for land (“debt-for-nature swaps”). This is in agreement with the UN proposal to remove such lands from development (the selected lands are mineral bearing, suitable for energy development and rain forests, called jungles in the old days). The result: UN bureaucracy in each country; no national development without UN approval. This is to be our one world government. The seriousness of these environmental fallacies can not be overrated. If you are concerned about a recovering economy or continuance of self government, understand the political promise is a new economy with high paying, high tech jobs. That doesn’t cover the greater proportion of the population. Our political leaders have condoned or at least permitted the closing down of extractive industries by the Greens. This continues. 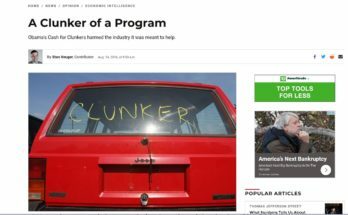 There is a concurrent loss of manufacturing jobs. That leaves tourism and service industries as employers. But only extractive industries and manufacturing contribute new wealth to the economy; the others redistribute it. Next Article Trump is an American Nationalist – Are You?